Front Doors must be stylish, secure and offer the best in heat insulation. When danger is lurking wherever you go, your home must be the safest haven you will ever have. But sometimes, even your home cannot escape the claws of danger. In a world where the only place you can trust is your home, how can you be insured of its safety? Let us just say that a fortified door is the answer. Having composite doors installed in the front doors of the house can give anyone maximum protection yet not compromising the sense of style and the overall appearance of our house. Unique composition Compared to ordinary doors, composite doors are made of multiple kinds of materials; thus, having a longer life span and high security performance. It has a Polyvinyl Chloride (PVC) on its outer edge with galvanized steel reinforcement. PVCs are the world’s widely-used plastic which is considered to be rigid yet flexible. Aside from its outer edge, PVCs are installed in the door’s sub-frame for superior stability and also have a 2mm PVC edge banding for the hinge and lock matching. Composite doors also have glass reinforced plastic (GRP) which is a highly reinforced yet light material on the surface to avoid denting. The 2mm GRP coating on the surface also provides the door its high resistance to warping, denting, cracking, and twisting. Having a GRP coated composite door, the owner can be secured that his/her door need not be repainted on a regular basis. Aside from the door’s PVC and GRP materials, composite doors maintain its hardwood inner frame for torsional rigidity. It also provides the door its sturdy feel, and is incomparable to regular wooden doors due to its weight. Aside from the materials used on the door, one can be secured of its door stop and threshold. It is 15mm low and has a part M compliant for wheelchair access. One just need to choose the same colour as the door frame for maximum style and protection. The huge difference of the composite door from the regular wooden door is its innovative heat insulation. With its thermally-insulating polyurethane foam core, one can be secured that the door regulates the heat inside the house. It is also 100% CFC free so the family can be secured of the health and environmental implication of using polyurethane foams. 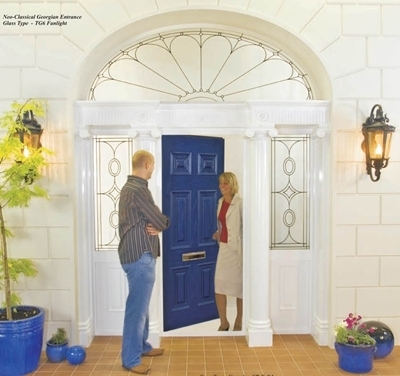 Your door to safety Composite doors offer a wide-range of possibilities for the convenience and safety of one’s home. Being low-maintenance, rigid, and long-lasting, it knows the level of security one needs in terms of safety, style, and money. It is safe to say then that composite doors are the best front doors. The kind of doors you choose for your home depends on the style and type of building. The most popular choices for external doors include wood, steel, and fiberglass. Whichever type of external door you opt for, you need to ensure that it can provide security, privacy, and protection from the vagaries of harsh weather.The quality of your exterior door will depend on the type of material used to construct it, as well as its installation technique. While wood and fiberglass are relatively expensive material choices for your external doors, steel is cheaper in comparison. To take maximum advantage of natural light, select exterior doors that are sufficiently illuminated. For this, you may go for doors with glass panels or those that are entirely constructed out of glass. For maximum security, go for an external door which is strong and has an equally strong door frame. There is no point in having expensive locks on your external doors if their panels are not strong enough. When you are talking about front doors for homes, you need to consider several things; Think about the material first. This is a serious concern that you need to have in mind when you are making a decision. There is a lot that needs to be looked at when you are talking about the design of the doors. After the topic of material has been looked at then comes the design that will be on your front door. This is again an important aspect that needs to be addressed when it comes to getting the most out of persons home and letting the rest of the world know about the home in general. Something that is simple is often the better choice for the fact that they tend to be cheaper and not give off an impression that the person is trying to show off. Properly placed doors help add lighting to rooms while also providing an extra entrance or exit for your home. Patio doors are used to gain access to a patio or porch, but they can also be used as unconventional separating doors throughout your home. It’s important to choose the right doors to fit your intended purpose. The most common type of patio doors is sliding doors, they are cheap and are accompanied by a screen. This slides on the track system. French style doors are a good choice when you want a more decorative touch, or you want to use them to replace doors within your home. French doors can be made from most of the popular materials.